Even though cil2007 has already been going on for two days, today felt like things really got started. 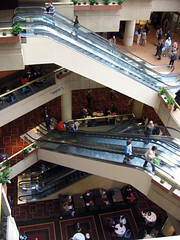 I ended up spending as much time in the exhibit hall as in the sessions, talking to vendors and other librarians. Which is unusual for me, but I learned quite a bit today. Today's sessions were good. The first was about the South Carolina State Library's experience with migrating their website to the Joomla CMS. It wasn't as in-depth and "here's how we did it" as I had hoped, but they did talk a bit about frustrations and surprises they encountered along the way, which is good to hear before starting a project. I am hoping to sometime in the future help convert my library's website from static html to something more dynamic, rssy and all 2.0'd out, and seeing what CMSs are out there helps. This session complimented nicely the next two I attended – Comments in Catalogs, and then an overview of LibraryThing (and the new LibraryThing for Libraries). This entire track focused on modernizing libraries' approach to web stuff, and how we can best communicate with patrons – primarily by making sure we look at this communication as a two-way street. For instance, opening up our websites and catalogs to allow for patrons to comment directly on our materials not only involves patrons in their libraries by giving them ownership, but also provides us with invaluable social data on how and why our materials are used. And it was this social data that Tim Spaulding is mining and using with LibraryThing. Regular people know what they think of books. Tim's entire approach has been to let people associate keywords with specific books, and then let the groupings of those keywords speak for themselves. With the widget that is the basis of LibraryThing for Libraries, those groupings, (in the form of tags generating lists of similar books, suggested reading lists, etc) speaks loudly. If we would only listen. As Tim pointed out, library ILSs and opacs, and the traditional vendors that supply them, are not really listening. Neither is Amazon. These are all companies trying to make money (which is why Amazon is not the ultimate book website. LibraryThing is for readers and about books, whereas Amazon is for booksellers and about making money). But improving the usefulness of our catalogs with third-party plug-ins is a step in the right directions, and hopefully these obviously necessary add-ins will soon becomes standard fare of the big ILS interfaces – or smaller solutions like Scriblio. Interspersed between sessions I was talking to exhibitors, learning more about what library systems could replace Horizon, and what public pc/print station management software options are out there. I talked to quite a few, and need to sift through my notes (some other time) before I remember what's what. After the conference we got a personal tour of Alexandria, VA, dinner in the Old Town at the Union Street Public House, and then enjoyed Free Cone Day at Ben & Jerry's. Tomorrow is much more conferencing, and then flying back to Boston, if the weather allows. Posted under Conferences, Library, Technology on Tuesday, April 17th, 2007 at 10:13 pm, by Brian Herzog. Post and comments available via the RSS 2.0 feed. Both comments and pings are currently closed.